It’s no secret that we love all things monogrammed, but lately we have noticed some of our favorite celebrities–Taylor Swift, Lauren Conrad, Leighton Meester, and Blake Lively–supporting the trend! Taylor Swift is everyone’s sweetheart… Stunning us all with her incredible looks, friendly personality, and delicate style (it’s no wonder she made it onto Forbes’ Most Powerful Women list). To top off everything we love about Taylor, we have spotted her rocking a monogrammed necklace similar to our Monogrammed Signature Necklace. Whether we are adoring her TV personality from The Hills (still), gushing over her personal style, or obsessing over her new Disney-themed fashion line at Kohl’s, we have all fallen head over heels for Lauren Conrad! So obviously when we spotted her wearing a monogrammed necklace like our Cut Out Single Initial Necklace, we nearly fainted. Who can forget the dynamic-duo that forever changed our lives… Blake Lively & Leighton Meester! Since their debut as Serena van der Woodsen and Blair Waldorf on the TV series Gossip Girl, we have all been swooning over their unique and stylish fashions. We have spotted them both wearing monogrammed necklaces similar to our Monogrammed Taylor and Split Chain Necklace styles! So while monogrammed jewelry has always been a love of ours, we are happy to see some of our favorite celebs rocking the trend. Get the celebrity style you adore with styles from Marleylilly.com. Tell Us! 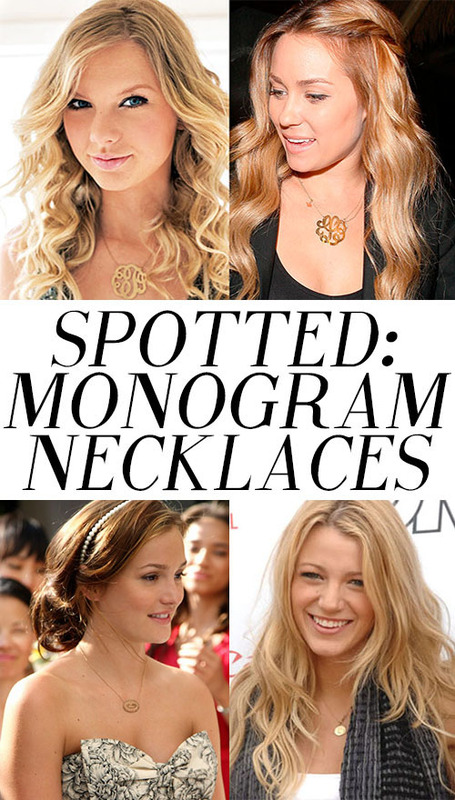 What's YOUR favorite monogrammed necklace style?